Just as a world map is a representation of the physical world, Chronologium Academicus is a representation of the academic landscape. It provides an overview of the “geographic” differentiations of academic areas, disciplines, and time that bound or computer-based references cannot match. Chronologium Academicus presents the first visualization of the whole of history and academia, effectively delimiting and systematizing the scope, breadth, and parameters of academia. Consider History, the Humanities, the Social Sciences, and the Sciences as its continents, the individual disciplines as its countries, and the individual entries (or isolated bits of information) as its cities, towns, rivers, and forests. 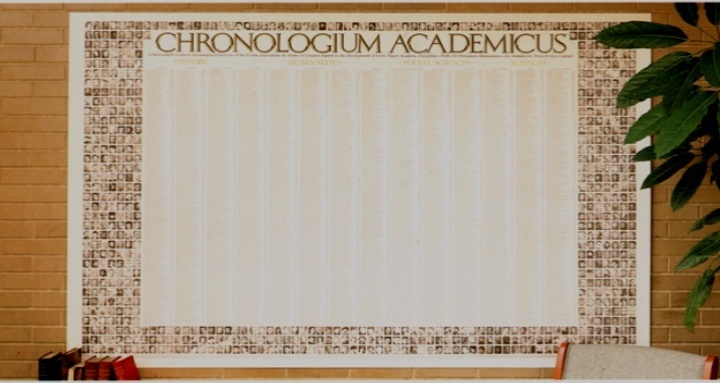 Vertically, the 14 columns of Chronologium Academicus present the history of every major academic discipline from the development of language to the present. The three opening History columns are presented in geographic order from west to east, and the other 11 columns are laid out in three groupings (Humanities, Social Sciences, and Sciences) from the most normative to the most empirical disciplines. However, its overwhelming distinction is its horizontal, or "longitudinal," layout: at any point all the way across the columns, each row covers the same years. That feature places the isolated bits of information of every major discipline into the historical and academic context of every other discipline, thus providing an overarching framework for history and all of academia. WHAT IT IS and WHY IT'S NEEDED are addressed more pointedly elsewhere, but first, we address the central problem of our educational system, which Chronologium Academicus is intended to help solve. Our students have learned one lesson very well: with the exception of mathematics and some of the sciences, once final exams are over, they can largely forget what they learned that semester because they are unlikely to be called upon to use it again. And, our graduates soon learn that there may be economic rewards for passing through our educational system, but little else. Our system continues to emphasize the vertical accumulation of knowledge, one subject at a time, and never provides an overarching framework through which the linkages between subjects can be made and seen. That central and most unfortunate shortcoming of our educational system may largely explain the perception of many students and graduates that their education consists of isolated bits of information of little relevance or meaning. Our graduates receive diplomas and degrees, but seldom an education. If education’s perceived relevance and meaning isn’t changed first, the potential benefits of any of the other changes that are being considered by educators and political decision-makers are diminished beforehand. We need to transform our educational system into one which not only imparts the isolated bits of information that are the components of knowledge, but into one which also helps link them together into an education─from subject to subject, year to year. And, ideally, there should be not only economic, but societal rewards and cultural reinforcements for education. Unfortunately, the difficulty involved in reaching consensus on any systemic change usually results in changes being made only at the margins. However, with Chronologium Academicus we now have an innovative, full-blown alternative through which we can start to solve the problem now, instead of waiting for some future agreement on systemic changes. In the next section, WHAT IT IS, we address the nature of Chronologium Academicus. "it is to academia and time, what a world map is to geography and place." *The website is best viewed at normal, 100% magnification. (Alignments do not hold at 75% or lower, nor at 125% or higher).